Imagine a world where your access to digital content is based on your identity rather than the device you're using. Because in fact, your identity is not tied to any particular point or consumption device. Such is Sun's vision behind digital rights management (DRM) where the focus is on network identity as the place where your rights live and are accessible. This edition of Innovating@Sun with host Hal Stern welcomes Tom Jacobs, director of research at Sun Labs (a.k.a. voodoo computer scientist) to discuss Project DReaM, Sun's acronym for Digital Rights Management Everywhere Accessible. Hollywood's opinion on the topic and Sun's area of focus – customers in enterprise, healthcare, government, education, finance and securities. The Government Video and Technology Expo serves the equipment and educational needs of professionals working with video, audio, multimedia, conferencing technologies and broadcast in the federal, state, and local government, as well as in law enforcement, education, religious, and the non-profit sector. 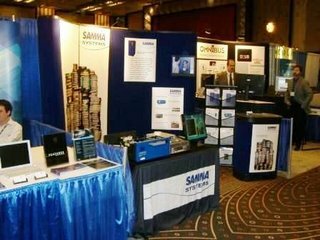 The event combines an exhibit hall, educational sessions, and individual conference programs bringing government buyers and vendors together for the ninth year running . The Society of Motion Pictures and Television Engineers is the leading organization for professionals in motion imaging technology, and for 90 years they’ve been bringing together industry experts on the technological cutting edge to share their knowledge. This year's Conference at the Renaissance Hotel in Hollywood, brought together the latest in High Definition, Film Technologies, the Digital Intermediate, Video IP Workflow, and a host of other hot topics. This year's National Association of Broadcasters convention at the Javits Convention Center in New York featured more than 100 training sessions in cutting-edge production and post-production techniques and an exhibition that showcased the latest audio, video, content creation and asset management technologies. The Association of Moving Image Archives held a successful 17th Annual Conference in Anchorage, Alaska from October 10 to 14. Some attendees took time to enjoy the views and natural richness of the Alaskan environment, while visits from a local husky team added to the experience. Next year's conference will be held in Rochester, NY. The MIC (Moving Image Collections) initiative, a collaborative between the Association of Moving Image Archivists (AMIA) and the Library of Congress, is interested in your feedback to better assess how we are doing, where we can improve, and what future strategic directions to take. As many of you are aware, MIC documents moving image collections around the world through a catalog of titles and directory of repositories. It provides a technology base and informational resources to support research, collaboration, and preservation. It is a portal for integrating moving images into 21st Century education and a key access program of the Library of Congress' National Audio Visual Conservation Center in Culpeper, Virginia. Get Email Updates for DAVA! Do you want to get email every time DAVA is updated? Click here to send us your request. Just make sure it's coming from the account you want receive email at, or indicate the desired account in the body of the message.